Is your car ready for new tires? Better question – do you know what to consider when looking at your tires to determine if you need new ones? For a lot of car owners, these questions are hard to answer. That’s okay though, we understand that not everyone is a car and tire expert. At Abbotsford Chrysler, we want to provide you with all of the important information you need to know about tires for your Chrysler, Jeep, Dodge or Ram vehicle so you always know when your tires are safe to drive on and when they need to be replaced. Below, we’ve outlined how to tell when your car is ready for a new set of tires, how to maintain your current tires, and the best way to store any tires you’re not currently using. Simple wear and tear from everyday driving is the most common reason that you’ll need new tires. Even if you’re always driving on perfectly smooth roads with no gravel and potholes, those miles on the tires start to add up after a while and will wear down the tread of the tires. The minimum allowable tread depth on a tire is 1.6 mm (1/16 in). If your tires reach that point, you must replace your tires. Your tires can begin to lose their grip on the road in rainy conditions once the tire tread depth reaches 3.2 mm (4/32 in). To minimize the amount of risk with your tires, and because the snowfall each year in Abbotsford plays such a big role in our driving conditions, you should begin to think about replacing tires on your car when the tread depth reaches 4.0 mm (5/32). By having this added depth, your tires will be able to push out or compress enough water or snow to keep them connected to the road and keep you safe. Make sure you’re up to date on what to look for when inspecting your tires. Other types of wear and tear on your tires aside from low tread depth may include cuts, cracks, bulges, or blisters on the sidewall of the tires. Bulges and blisters on the tires should be especially concerning for you because it could mean the tires have a weak spot in them which could lead to a blowout. Before you put new tires on your car, there’s one very important factor to keep in mind: you shouldn’t put new tires on a car with misaligned wheels or bad shocks. This will cause your tires to wear more quickly – which will make you come back for a new set of tires again way before you should ever have to – and you also won’t get enjoy any of the new handling and safety benefits of the new tires. 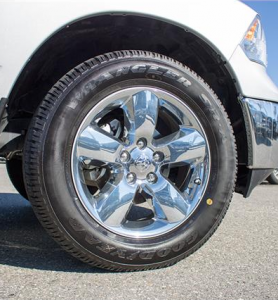 Every car has a manufacturer recommendation for the size and type of tire that is best suited for your vehicle. You can often find this information in either your owner’s manual or on a placard that’s attached to your car along the edge of the driver’s side door. The tires that come with your car are selected to provide you with the best ride possible. The manufacturer does recommend sticking with those predetermined tires. However, those original tires may have a higher price tag than some other tires. There are similar options available at a lower cost, but you will sacrifice some of the benefits. Regardless of wear tires will wear out after six years, so make sure that the new tires you purchase are, in fact, new. The numbers labeled on the sidewall of your tire will indicate the “born on” date of your tire. Look for a four-number combination like 1515, which indicates that your tire was manufactured during the 15th week of 2015. After your car has its new tires installed, give them a break-in time of about 800 km (500 mi) to allow for the removal of any lingering residues from the manufacturing process. These residues from the manufacturing processes could increase braking distance slightly or reduce ideal handling in their first few weeks. Schedule tire maintenance appointments to get the most out of your tires. Uneven wear: Check once a month to see if you notice any small issues before they become larger issues. How your car handles: If it’s pulling to one side of the road it could suggest a tire is underinflated or damaged on that side of the car. Any vibrations that you feel through your steering wheel. Raised portions of the tread or sidewall of the tire: This could indicate a tire belt in the tire has separated. Regularly checking the air pressure of tires should be a top priority of all drivers. The maximum air pressure of your tires will either be given in Kilopascals (kPA) or pounds per square inch (PSI). However, the maximum pressure listed on your tire usually exceeds the recommended air pressure from your manufacturer, which can found in your owner’s manual or information placard. Always rely on your owner’s manual for the appropriate tire pressure on your Chrysler, Jeep, Dodge or Ram. Always keep in mind that all tires will leak over time, but cold temperatures can accelerate how quickly the tires leak its air. Ever month, you should check your tires, including your spare tire, while they’re cold, not right after a trip when they’ve had time to warm up. If you drive with an underinflated tire, it causes your tire to wear more quickly, lowers the fuel efficiency of the car, and could lead to a dangerous blowout of your tire. When the tire is overinflated, it causes an additional flex in the sidewall, which creates excessive heat within the tire. There are times when your tires need a professional scheduled maintenance appointment. Luckily for you and your tires, that’s where the Abbotsford Chrysler Toyota service team comes in. We can help your Chrysler, Jeep, Dodge, or Ram tires last longer with regular tire rotation, tire balancing, and wheel alignment. You should rotate your tires according to what your manufacturers manual recommends, typically every 8,000–11,000 km (5,000–7,000 mi). Tire rotation ensures that all four tires wear evenly and maximizes the lifespan of your tires, this is especially beneficial for your tires because your front and rear tires manage different loads and functions. Also focusing on making sure there isn’t uneven wear, tire balancing occurs when technicians add small weights to your wheels to dampen any vibration. You should expect to have your tires balanced each time your tires come off your vehicle, or whenever you notice a vibration. Wheel alignment keeps your wheels and tires exactly perpendicular to the road. Over time, your wheels can begin to tilt slightly inward or outward, making them wear uneven, which reduces your handling abilities. Learn more about wheel alignment for your Chrysler, Jeep, Dodge, or Ram. No matter if you need help selecting a new tire, or think it’s time for a scheduled maintenance appointment, Abbotsford Chrysler is the go-to choice for expert care, opinions, service and the best prices.